A friend sometime ago said to me, ‘I would like to spend some time with you so I can get to know you, but you are always going and doing yoga yoga yoga.’ We laughed, and I acknowledged that I was busy with yoga yoga yoga. And I love being busy with yoga. Preyoga I ran for my exercise and to combat depression and anxiety. The willpower to get up early- before the kids wake up for school- and jet around the neighborhood was and is a test of mental toughness. Lengthening the stint of my run I quickly learned was again a mental beast. Toughening up my body entailed some tough will and mental conditioning also. A marathoner once told me that 15 miles in, is fitness and the last 11 is mental. I suppose that’s why I have only ever managed half marathons, I am not mentally prepared for pushing through the pain and exhaustion. Enter yoga. My yoga journey really has brought home the connection of mind body and spirit. This connection is what has me floating out of a yoga class all blissed out. 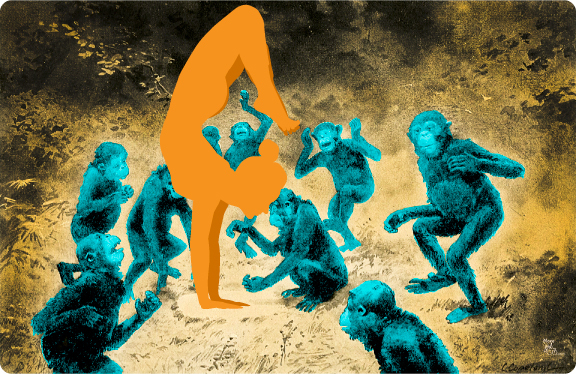 It is serious mental work to drop the monkey mind- the endless ream of random thoughts- concentrate on the breath, and go upside down. I like being strong and knowing I can get up and run some miles, make it thru a tough vinyasa sequence and just go go go all day. But equally I like knowing I have the mental strength to push through the ‘I can’t, don’t feel like, tired’ refrain. Mental strength has helped me gain physical strength and a huge portion of gratitude keeps me in grace.